Corned Beef Hash “Benedict” with a spicy hollandaise sauce. Photo courtesy Delmonico’s. When life gives you lemons, make lemonade. When it gives you corned beef, make corned beef hash with the leftovers. Corned beef hash is a treat. We serve it with poached eggs and ketchup. 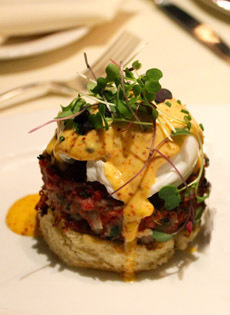 This fancier recipe, for Corned Beef Hash “Benedict,” was created by William Oliva, executive chef of Delmonico’s Steakhouse Restaurant in New York City. It turns the corned beef hash into patties that replace the Canadian bacon in Eggs Benedict. A spicy hollandaise replaces the conventional hollandaise sauce. This recipe is doubly Delmonico’s: Eggs Benedict were invented there in the 1860s (here’s the story). Vegetarian? Try this recipe for Portabella Eggs Benedict. Melt butter in large cast iron skillet over medium heat. Add onion and red pepper; cook until slightly browned. Add thyme and Tabasco sauce to mixture; stir. Add cabbage, potato and corned beef; cook until flavors have blended, approximately 10 minutes, stirring occasionally. Remove from heat; allow mixture to cool. Form mixture into 6round patties. Whisk egg yolks, lemon juice and Tabasco sauce in a bowl until slightly thick. Place bowl over saucepan of lightly simmering water. Continue to whisk until sauce is warm and thick. Slowly drizzle melted butter into bowl; continue whisking until sauce has doubled in volume. Cover to keep warm. Fill medium-sized shallow pan halfway with water. Add white vinegar; bring to a boil. Lower heat to a simmer; carefully add eggs. Cook about 3 ½ minutes; remove with slotted spoon and place in bowl. Heat oil in skillet to medium-high heat; add hash patties and cook on both sides until browned and slightly crisp. Remove patties from pan with spatula and place on serving plate. Carefully place one egg on each hash patty. Top each with spicy hollandaise and sprinkle with chopped parsley. Recipe © Copyright Delmonico’s. All other materials Lifestyle Direct, Inc. All rights reserved. Photos are copyright of their respective owners.